Homeowners in Seal Beach, CA had chosen Thermory Benchmark cladding for the exterior of their home, and opted to let it age naturally instead of oiling it to preserve the color. When remodeling the living room, their open design and large windows meant an accent wall would be visible from the outside. Their modern sensibility required a simple, contemporary material to bridge the gap between the natural outdoor setting and the clean indoor aesthetic. 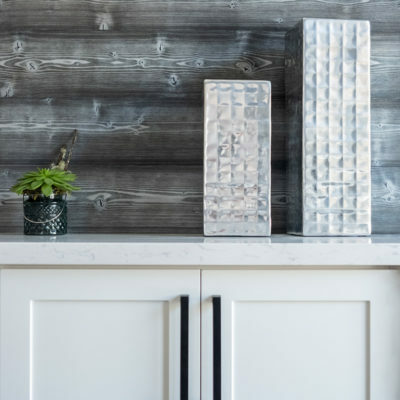 As the Benchmark cladding on the exterior of the house will age to silver, the homeowners wanted to ensure their interior accent wall would complement the rustic finish while serving as a backdrop for their 85″ mounted TV. The home maintained a clean, simple color scheme inside with aspects of both modern and rustic design. They liked the idea of barn wood, but weren’t sure they’d find material that was consistent and clean enough to suit their needs. As interior cladding, they couldn’t take chances with unknowns like insects, mold or rot. The beautiful, naturally-weathered color of Thermory Drift interior cladding offered a rustic barn wood appearance that would complement the aged look of their outdoor Benchmark cladding perfectly. Because it’s thermally modified real wood, it offers all the best qualities of reclaimed wood without any of the unknowns. As the exterior Benchmark cladding ages, the inside and outside will come together for a unique, cohesive, naturally-aged aesthetic that is both modern and timeless. The beachfront home faces some harsh weather conditions, including salt, wind and dry air – Thermory’s expert modification process provides boards that stand up to the elements for decades. The Thermory boards weren’t just modified and milled to look great. Those processes contributed to installation. The uniformity of the boards meant there were no crooked pieces or uneven ends, making installation a breeze. JEM Joints created a clean, tight seams with very little wasted product. The interior and exterior projects were being completed simultaneously, and the timeline was tight. They requested samples of many products, including Thermory. While some of the samples looked cheap and unreliable, Thermory samples looked incredible and arrived quickly. The product order was also shipped promptly and arrived without damage, allowing them to complete the project within the desired timeline. "If I didn’t have the Drift series, I would not have been able to recreate the look of the outside and produce something inside that will immediately match a year aged outside." Our Drift Spruce interior cladding provided the desired aesthetic without sacrificing durability and strength.